Tributes have been paid to Leicester City chairman Vichai Srivaddhanaprabha after it was confirmed he died in a helicopter crash outside the King Power Stadium on Saturday. The 60-year-old Thai businessman was one of five people killed when his helicopter lost control and crashed in a car park following Saturday's 1-1 draw against West Ham. Under Srivaddhanaprabha's ownership, Leicester secured promotion to the top-flight in 2014 and, against odds of 5,000-1, won the 2015/16 Premier League title. Leicester goalkeeper Kasper Schmeichel said Srivaddhanaprabha "changed football" and "gave hope to everyone that the impossible was possible". Striker Jamie Vardy, who scored 24 Premier League goals in the season Leicester won the title, wrote on Instagram: "Struggling to find the right words....but to me you are legend, an incredible man who had the biggest heart, the soul of Leicester City Football Club. "Thank you for everything you did for me, my family and our club. I will truly miss you.... may you rest in peace." Leicester captain Wes Morgan wrote on Twitter: "Absolutely heartbroken and devastated regarding the news of our chairman. "A man that was loved and adored by everyone here at LCFC and someone who I personally had the utmost respect for." Meanwhile, Prince William, the Duke of Cambridge, said he was "lucky to have known Vichai for several years", and praised Srivaddhanaprabha for his contribution to football. Prince William said in a statement: "My thoughts today are with the family and friends of Vichai Srivaddhanaprabha and all the victims of the terrible crash at Leicester City Football Club. "I was lucky to have known Vichai for several years. He was a businessman of strong values who was dedicated to his family and who supported a number of important charitable causes. He made such a big contribution to football, not least through Leicester City's magical 2016 season that captured the imagination of the world. Prime Minister Theresa May said on Twitter: "My thoughts are with those family, friends and supporters connected to the tragic crash outside Leicester City's stadium on Saturday night. The outpouring of grief is a testament to how many people's lives were touched by those on board." 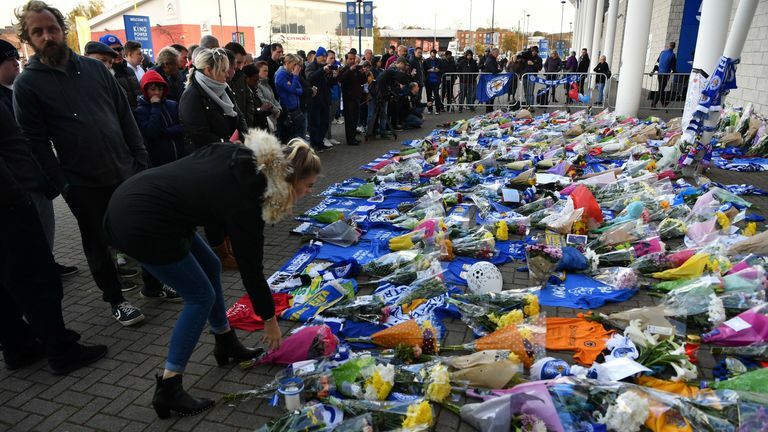 My thoughts are with those family, friends and supporters connected to the tragic crash outside Leicester City’s stadium on Saturday night. The outpouring of grief is a testament to how many people’s lives were touched by those on board. Leicester right-back Danny Simpson said on Twitter: "Thank you for everything you have done for me, the players, the fans, the club and the whole city of Leicester. "You made mine and everyone else's dream come true.I am devastated and can't quite process what has happened but we will do our best to help this club grow." Leicester midfielder Wilfred Ndidi thanked Srivaddhanaprabha for coming out to watch him in World Cup action for Nigeria. Ndidi wrote on Twitter: "You were far too kind and supportive. Thank you for all you did for the club, for always encouraging the team and coming all the way to watch me play at the World Cup." Shinji Okazaki, who joined Leicester back in 2015, said on Twitter: "I am deeply saddened to hear of the loss of our president... I am honoured to have known him here in Leicester. He was truly a great man for the club and for me as well." England's most capped men's player and former Leicester goalkeeper Peter Shilton witnessed the helicopter crash. He wrote on Twitter: "RIP to the greatest ever owner of @LCFC. It was a privilege to have met him and condolences to the families who lost their loved ones in last night's tragedy." The Premier League's executive chairman Peter Scudamore said in a statement: "My Premier League colleagues and I are devastated to learn that Leicester City FC Chairman Vichai Srivaddhanaprabha and four other people lost their lives in the helicopter crash outside King Power Stadium last night. "Our deepest condolences and heartfelt thoughts go to the Srivaddhanaprabha family and all the relatives and friends of those involved in this tragic accident. "Vichai was a gentleman who graced the game with his civility and charm and we will miss him enormously. His impact on Leicester - the football club and city - will be remembered forever." Sky Sports managing director Barney Francis said: "This is a shocking and tragic event. As we try to come to terms with this awful news our hearts go out to the family of Vichai Srivaddhanaprabha and everyone connected to Leicester City football club." The Premier League added: "To honour those who lost their lives, the Premier League match between Tottenham Hotspur and Manchester City on Monday night will be preceded by a minute's silence and players will wear black armbands. "We all support our friends at Leicester City FC at this incredibly sad time." Following the sad confirmation of fatalities in last night’s helicopter crash, Manchester City sends its deepest condolences to all at @LCFC. Tributes have come flooding in from a host of Premier League clubs. Leicester were set to face Southampton in the Carabao Cup on Tuesday, but that match has been postponed. Southampton said in a statement: "The thoughts of all of us at Southampton Football Club remain with our colleagues at Leicester, the Srivaddhanaprabha family and everyone affected by the tragic incident." Tottenham wrote on Twitter: "We are deeply saddened to learn of the deaths of Vichai Srivaddhanaprabha and the other passengers on board the helicopter that left the King Power Stadium last night." Everyone at #MUFC is deeply saddened to learn that the Leicester City chairman and four fellow passengers have lost their lives following last night's tragic incident. Our deepest condolences are with their families, friends and those connected to the club. A statement on West Ham's website read: "The thoughts of everyone at West Ham United are with the directors, players, staff, supporters and all connected with Leicester City Football Club following the devastating events at the King Power Stadium on Saturday evening. "We would also like to express our admiration for the emergency services who responded so swiftly and with such bravery, and offer our support to anyone, including any West Ham United supporters, who may have witnessed the tragedy." A statement on Liverpool's website said: "The admiration we have for Vichai, his family and colleagues is as high as you can imagine, both professionally and personally. "He was the ultimate custodian for the club he bought and then gracefully served. The Premier League title win, one of world football's all-time great stories, is of course the standout achievement. But beyond that, he led his club in a manner which all of us in this privileged position aspire to. Success on the pitch, allied with outstanding governance off it. "Vichai is a great loss not just to his club but to the Premier League and English football as a whole. "The thoughts of everyone connected with Liverpool Football Club are with our friends in Leicester and Thailand."